I am an intuitive Astrologer and Tarotist, a Thinking Partner and Thinking Partnership Teacher, and a Spiritual Companion who has pursued a lifelong interest in the journey of transformation and inner healing each of us are invited to explore. My consultations are informed by my deep knowledge of the metaphysical traditions, my Time To Think accreditation, my study of Integral theory and the transformational perspectives of depth astrology, tarot, archetypes, symbology and mysticism. All my sessions help you to lead a life in integrity - one in which body, mind, heart and soul are united. No matter what type of session you choose to book with me I hold an unconditional presence for your journey, accompany you as that journey unfolds, give counsel when invited to, and encourage you through all the turns and twists of this magical journey. Enjoy my heart centered approach and bask in the warmth of my interest in you. My foundation session starts my relationship with you. In this two hour session I share an insightful, intuitive perspective of YOU using the transformational tools of depth Astrology and Tarot and the rich language of archetypes and symbology as a catalyst to explore your life patterns and themes, the web of relationships in your life, your life direction, your soul purpose, and the quality of your choices. This two hour consultation encourages psychological, intuitive and spiritual growth which engenders physical, mental and emotional wellbeing. By the end of our time together you will have gained inner illumination, bringing light to your understanding of all the levels of yourself. I tell all my clients that their heart will tell them when to connect with me again. I am delighted when they do and offer a 90-minute consultation in which together we focus on current themes in your life and the opportunities arising, once again using as a catalyst the tarot cards, perhaps a dash of astrology, and always the rich subtle languages of archetypes, symbology and mythology. Spiritual counseling is offered as part of the reading. If you wish the session can be shaped around any specific concerns you may have. Please note that follow up sessions is solely for clients I have worked with before in a foundation session. For clients from countries whose currencies are presently under strain please contact me to negotiate an appropriate fee. Soul Companioning is the art of companioning another for a period of time on a journey impossible to accomplish alone. This journey is entered into when an occurrence happens in your life that feels like a crisis, but something within you knows there is a deeper dimension to what you are feeling or experiencing. In a space drenched with respect, care, quiet, attentive listening and exquisitely crafted questions, we enter into a conversation to excavate your essence, your authentic self. We allow your heart to be heard and for you to experience the privilege of truly being seen by another. In this dialogue we allow excessive busyness to fall away and rigid old identities and stories to dissolve. We invite the not quite seen which is flirting on the horizon to engage us and gift us with the courage to enter the unknowing of what is to come. As we witness and listen together, we invite the light of life to infuse what is about to be born. Our journey together is a springboard to a deeper self-knowledge and personal authenticity, bringing meaning and coherence to your life. There are many reasons that bring us into a journey of soul companioning. Oftentimes it is the great passageways of life that rip a whole part of our life away and bring us to look for companionship and guidance. The loss experienced when a marriage ends, from being in a relationship to venturing out as a single again, a business is sold, a loved person dies, we retire, or our health falters, may begin the journey. Sometimes we get stuck and cannot move on, from student to working adult, from young mother back to working life, to not being able to finish a project or thesis. These issues in some way do not allow the seasons and tides of our life to turn, requiring a steady patient companion to wait and witness with us until we have the courage to allow life to transform us. We start with the Transformational Guidance Foundation Session and continue with one or more sessions shaped around you. Foundation Session Fee is UDS 100.00 ZAR 700.00 an hour locally. Follow up sessions are USD 65.00 per hour internationally - ZAR 400.0.0 an hour locally. Honouring the integrity of each person, we explore the meaning of the bond between them - the emotional needs and dynamics - how they communicate, underlying and often unspoken expectations and the potential for shared growth. We listen together to the third body of the relationship and how to work with its light and presence, allowing real communication that opens the relationship to the flow of life, love and commitment. These sessions are for all kinds of relationships; intimate, marriage, business, friends, parents and children. In a sacred, empty yet dynamic space, we enter a dialogue of exploring your longing for the Divine and how you are being invited to enter and live that relationship with the Beloved. I work with clients of all faiths and traditions, or of no tradition at all, in sessions that require a commitment to conversations around inspiration, inquiry, dream work, shadow work, contemplation, practice, silence, prayer, meditation and witnessing. An honesty, that can be challenging, will enter your life as integrity and congruence begin to form. My own personal practice and love of Christian and Sufi mysticism will enrich our dialogue. I absolutely LOVE offering Thinking Sessions and can't wait to share them with YOU!!! I offer the rare experience of listening to you think within the quiet presence of my complete and generative attention, respect and ease. As your Thinking Partner, I create an environment in which you can think for yourself and move from what limits you to what liberates you Transformative listening is nearly a work of art. It comes from genuine interest in where the thinker will go next in their thinking combined with questions designed to help catalyse your thinking. Who would enjoy a Thinking session? Anyone! Anyone who wants time to think about any issue they are facing whether as simple as "what color should I paint my garden pots?" to something as complex as "what is the most powerful thing I can do today for my company?" If you are having trouble making a choice or a decision, it is often because there is something blocking you from doing so. This work follows the mind's natural tendency to want to remove blocks so you can move into action and empowers you to think about what you want for yourself. Perhaps the most powerful use of the thinking session is to commit to a regular practice. This can be at a regularity to suit you. My clients are all very different, from the sole entrepreneur who finds a daily thinking session a necessity, to the CEO who uses his weekly session to think through company challenges, and the mother who would not miss her monthly session for all the world as she says it keeps her sane or the client who books a session when he feels his thinking clogging up. This is about you so you drive the number of sessions and the content. Be held with Attention, Ease, Appreciation and Equality as a Thinker. Think for yourself without interruption. Learn to think deeply and rigorously. Be listened to with deep, generative attention and know that everything you think and say matters. Find answers to questions in your own words and through your own thinking. Become more aware of yourself through your own thinking. Clarify and work on a goal or issue and what is standing in the way of achieving that goal. Uncover limiting assumptions and transform them into liberating ones. Experience a more expansive, creative, empowered and joy-filled life. Treat yourself to a Thinking Session. My affordable pricing allows you to book a session anytime you fancy one! Sessions are one hour long and are held on Zoom or Skype to clients globally. International clients (Australia, Britain, Europe, United States and Singapore) USD 55.00 per session . Africa (South Africa, Botswana, Nigeria) ZAR 350.00 per session. I am accredited Time To Think Thinking Partnership Teacher listed on the professionals register on the Time To Think website. As a Thinking Partnership teacher I am available to teach the Thinking Partnership programme. Please contact me to schedule dates and a quote for the programme fee should you and two others be interested in learning to become a Thinking Partner. When Last Were You Able to Speak Honestly About Your Experience of Illness? "When I ask you to listen and you start giving advice, you have not done what I have asked. When I ask you to listen and you start telling me why I shouldn't feel the way I do, you are invalidating my feelings. I have lived with Multiple Sclerosis for 30 years and am deeply skilled in the traditions and modalities of silence and listening. I also bring to these sessions my learning that the experience of illness can be a growth path with profound lessons. The hour long Compassionate Listening Session is offered one to one by Zoom or Skype. Fee is USD 65.00 for international clients and ZAR 350.00 for South African clients. In Africa where I live, rain is seen as a blessing, a shower of praise falling on the earth. I am humbled daily by the clients I work with as it is an honour witnessing their journeys. I quote below what people say about their time with me - my showers of blessing rain from around the world.. Sessions are held with clients globally on Zoom or Skype (schuurmans1471). Please ensure your camera works! Payment by EFT or PayPal at time of scheduling the booking. The invoice is to be paid in advance – immediately on receipt of appointment time and invoice. For the Foundation session of Astrology and Tarot I do not open the gate to interpretation and preparation until payment is received. In this way I do not have data dancing in my head and no-one to share it with! From a place of respect I ask that you provide at least 24 hours notice should you need to reschedule the appointment. No fees are refundable once the appointment is booked or in the case of a no-show. I do consider kindness scholarships for anyone in financial difficulties. Price is then dependent on income and circumstances. All sessions held in person or virtually are recorded with a link to download the MP3 audio from DropBox. Please note that recordings are provided to clients as a courtesy and are not part of the consultation fee. due to equipment failure or any other reason. The recording will only be available to download for three weeks as thereafter it is deleted. Please contact me to book a consultation by completing the form below. Thank you for your email. I will answer your email with the information you asked for shortly. 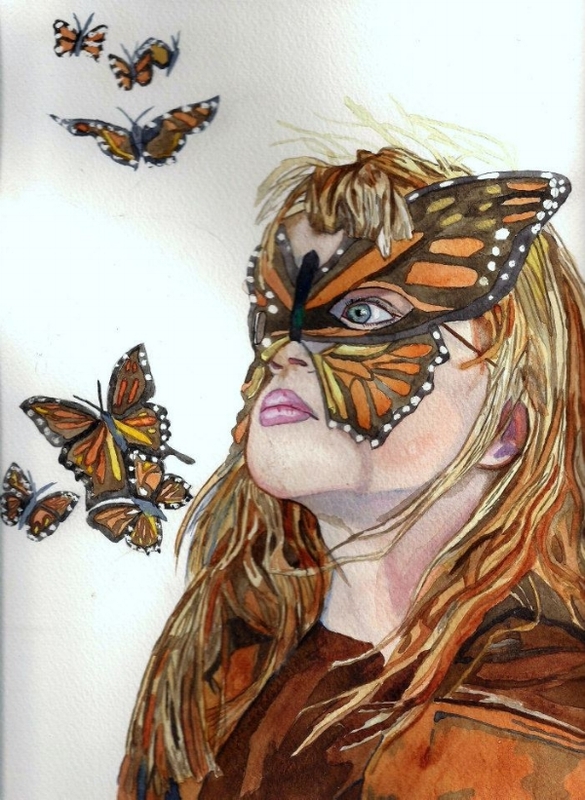 Autumn Butterfly painting by Nicky Campbell. Photographs credits Adriaan Norman and Greg Pullen. All rights reserved.